With the rise of different social media, many of us assumed that there will be a major decline in the email usage, in the last couple of years. But this is not the case, email still works and a recent research proves it more. Contrary to the assumption it appears that social media use makes people consume email more, not less. This is interesting and makes sense too as email allows companies to efficiently tell customers about their products and services in a well-managed form. You can’t do that in any social network. Moreover, the beautifully designed email templates make it easy to portray your message to your audience in a more engaging manner. There are lots of Email template out there but finding the perfect one can sometimes become a difficult task. 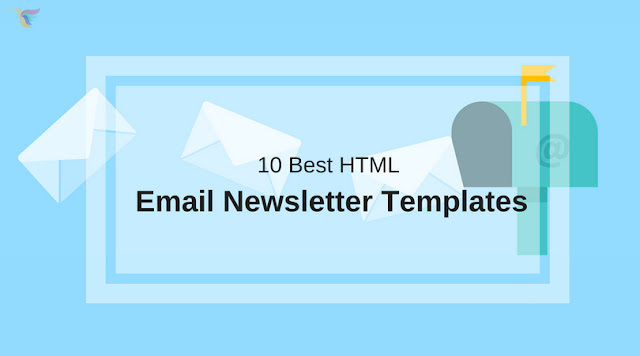 And that’s why we are here with this piece of content telling you about the “10 Best HTML Email Newsletter Templates”. So here we go…! JD Valentine Email Template is one of the best mobile responsive Email Template for Valentine Events. It provides you with the perfect blend of red and white color to give a user the feeling of love. This email template has been tested on almost every mail provider like Gmail, Yahoo Mail, Hotmail, GMX, AOL Mail, Apple Mail and Microsoft Outlook. You can customize the template as per your need in your favorite email builder tool like mailchimp, Acymailing, Stampready etc. Other than this, the template is very easy to edit with simple drag and drop in Stampready and edit the code to customize the design. Comes with over 80+ Modules and with a StampReady Builder, Spanda Email Template is a very professional email template in the market. It is also compatible with all the major email marketing platforms like MailChimp, Campaign Monitor, Mailster, HTML etc. Spanda is a Responsive Email Template for Education & Online Learning Course for who want to look different. Spanda Email Template is fully editable with online Builder feel free to Change layout and colors which enhances the beauty of the template even more. With the rise in Cryptocurrency, believe it or not there is a significant increase in the crypto related email template too. And if you are looking for the same then Cryptoo Email Template can be the template for you which is especially designed for Cryptoo Blockchain, Cryptoo Hosting, Cryptoo Exchange, Cryptoo ICO and Cryptoo Advisors..
Crypto Email Template is a fully responsive mail template i.e it will look amazing in every inbox, on every device. Along with this template is compatible to every mail provider like Campaign Monitor, Mailster, StampReady & MailChimp. Cryptoo is also fully editable with online Builder feel free to Change layout and colors which makes it more compelling. Bloom is a fully responsive multipurpose email template with a clean and engaging color options. If you want a different look to your mail template and want to stand out then this is the perfect email template for you. It comes with 6+ email template which are all compatible with StampReady Builder, MailChimp, Campaign Monitor, Mailster, HTML and other major email marketing platforms. You can easily edit and customize the layout and colors as per your requirements and as the way you like to make it more attractive. BlauMail Email Template is one of the best email HTML Template for creating a successful email marketing campaigns. Because of its multipurpose nature, you can use this template for almost any kind of email type. It comes with inbuilt 42 examples and 170 reusable modules which you can use in any way. Besides, this email template is compatible with all the major email builder like StampReady, MailChimp, Mailster and CampaignMonitor. Just choose the one you like and start building compelling mails. Retargeting your customer by an engaging email template is a proven marketing strategy and JD Real Estate Email Template does the same. It is a fully responsive cross browser compatible email template which is perfectly designed for the Real Estate Business. Designed with appealing colors, you can add up to 11 modules in your Email template and make sure your email is worth reading. Along with all this, the template has clean code with comments which makes it easy for developers to play around and edit the source code. Also, the template is so easy to customize even a newbie can customize it without any concern. If you are looking for a email template which you can use to send an email regarding you product launch then this template i.e - ProductMail Email Template is the perfect choice for you. It is compatible with all the major email service provider like iContact, Benchmark Email, MailChimp, Campaign Monitor or Constant Contact. The engaging design and perfect blend of colors in this template,, make your email marketing campaign a classy and memorable one. Along with this, drag and drop functionality make the template more flexible to use. Marquez is another professional email template for all business, organizations and creatives agencies who are in a search for a unique and engaging email template. This template is packed with 18 ready-to-use layouts and 80+ purpose-built sections that you can use in any way for starting a successful email marketing campaign. Other than this, this email template is compatible to all the major browsers and mail provider i.e your email will look good in each and every browser. Mosher email template is one of the best and a very high quality multipurpose email template which is especially designed for the cafeteria, coffee shop, diner, dining room, inn, joint, outlet etc. business. This email template is mailchimp ready and have 6 Custom Email Templates to provide you the flexibility to use the one which you like the most and is also compatible with all the major email builder. Showoff Email Template is the perfect email template for the people who want to find a gorgeous, and clean solution to their e-mail marketing needs. Showoff is the most versatile and complete email template available on the market. It comes with over 300 completely different modules and the new BigBangThemes builder makes it so easy to customize. So guys these are the best email templates which you can opt for you next successful email marketing campaign. If you got any suggestions for this list, feel free to use the comment section as we do read all of our comments and take them very seriously. This article s written by Naveen Kumar. He is a digital marketer by profession, blogged by passion and kind by nature. Naveen has a great collection of Joomla Templates at Joomdev. If you are looking for Joomla template framework then visit: www.astroidframework.com. Apart from working on Joomla templates, He stays busy with his naughty kid Nainish and love to convert ideas into reality. Follow him: Facebook | Twitter | LinkedIn.